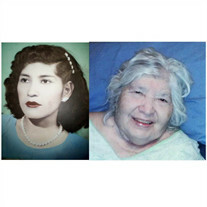 McAllen - Andrea Martinez Cantu, 87, passed away on Saturday, October 27, 2018 at Doctors Hospital At Renaissance in Edinburg. She was born on Monday, June 15, 1931 in Donna, Texas the daughter of the late Trinidad and the late Maria (Guerrero) Martinez. She is survived by her children: Ricardo Cantu of McAllen and Martha C. Peña of McAllen; two sisters: Inez Rodriguez of McAllen and Concepcion Treviño of Harlingen; three grandchildren: Maria Andrea Peña, Josefa Maria Peña and Justin Cantu; and hijo de crianza: Trinidad Cruz Martinez. Family wishes to give special thanks to her caregivers, Edna Garcia and Josie Peña for their love and dedication during her nearly 11 years of illness.